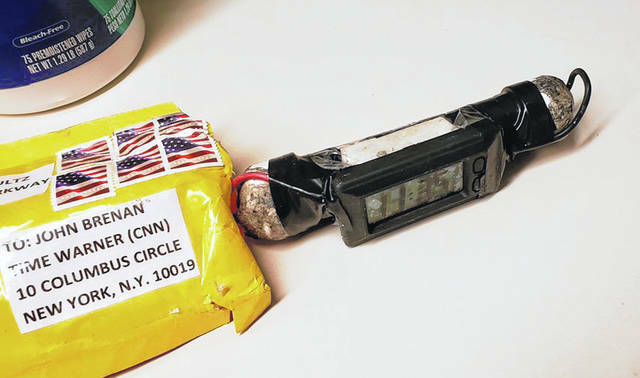 This image obtained Wednesday, Oct. 24, 2018, and provided by ABC News shows a package addressed to former CIA head John Brennan and an explosive device that was sent to CNN’s New York office. The mail-bomb scare widened Thursday as law enforcement officials seized more suspicious packages. WASHINGTON (AP) — Investigators searched coast-to-coast Thursday for clues to the motives behind a mail bomb plot apparently aimed at critics of the president, analyzing the mechanics of the crude devices to reveal whether they were intended to detonate or simply sow fear two weeks before Election Day. Law enforcement officials said the devices, containing timers and batteries, were not rigged like a booby-trapped package bomb that would explode upon opening. But the officials were still uncertain whether the devices were poorly designed or never intended to cause physical harm. A search of a postal database suggested at least some of packages may have been mailed from Florida, one official said. New details about the devices came as the four-day mail-bomb scare spread nationwide, drawing investigators from dozens of federal, state and local agencies in the effort to identify one or more perpetrators. In all, 10 packages had been discovered through Thursday containing similar explosives. The would-be targets included former President Barack Obama, Hillary Clinton, former Vice President Joe Biden, actor Robert De Niro, CNN and others. The common thread between them was harsh criticism from President Donald Trump. Much was still unanswered about the devices, and authorities offered no clues about any suspects. Details suggested only a broad pattern — that the items were packaged in manila envelopes, addressed to prominent Trump critics and carried U.S. postage stamps. The devices were being examined by technicians at the FBI’s forensic lab in Quantico, Virginia. The packages stoked nationwide tensions and fears as voters prepared to vote Nov. 6 to determine partisan control of Congress — a campaign both parties have described in perilous terms. Even with the sender still unknown, politicians from both parties used the moment to decry a toxic political climate and lay blame. At the briefing, authorities confirmed that at least some of the packages were distributed through the U.S. mail, and cautioned that there could be additional devices in the postal system. They said investigators searching for more suspicious parcels had not found any during the previous eight hours.